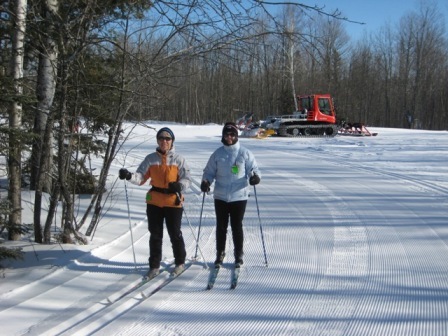 ABR is full service ski touring center with 60km of trails located on over 1100 scenic acres of varied terrain along the Montreal River in Ironwood Michigan. We offer skate/classic combination trails along with singletrack classic and even snowshoeing and multi-use/skijoring trails. We work on the trails full-time in the off months and have done substantial trail work each and every year since we opened to the public in 1995. In 2005 we did a major redesign of the trail system, including adding new trails and many revisions. In 2008 we did another major redesign putting our total k’s up to 60 km. You will most likely need to review the new map which was created with a survey grade of GPS. Pay attention to directional signs, some of the trails are now being skied in a different direction and a different sequence. This year we worked on a connector into downtown Ironwood that will be used for the SISU Ski Fest. Rudy’s Shoot was widened and regraded so it can be groomed with the Pisten Bully and will be skating and striding, it is also longer now and more accessable from the rental houses. We also did a considerable amount of work on fixing trouble spots in the exisiting trails that will make the trails ski better and groomer easier including regrading and banking the tricky Blueberry hill to make it more skiable. We have a well stocked rental shop with modern, comfortable rental equipment. We have both SNS, pilot and NNN binding systems. Our facilities include a heated warming cabin with light concessions, and a full service ski shop, change rooms, indoor restrooms, and a large heated wax area with many wax benches. There is additional room in the race barn/wax room for tables and chairs available for teams or groups to use. NEW for this year is Hi-speed Internet WIFI in the warming cabin from 9-6 daily. Lessons: We have a group of instructors that are on schedule most weekends and weekdays. Some are PSIA certified. Private lessons are $25 for 1 hour. Group lessons are also available. Rates: 2 people -$35, 3-$45, 4 – $55. Large group lessons available. It is best to call ahead to schedule lessons 906-932-3502. Wax services: We have 3 different wax services available from $8 to $35. Skis can be waxed while you wait (time permitting) or can be left overnight. “HOT BOX” service available and binding mounting services available. Sauna/Showers: 2 saunas are available for rent: an authentic private wood-fired Finnish sauna with a change room and hot shower or a private electric sauna with hot shower in the wax room. Both are available for $6/person/$12 minimum, shower only (in the wax building) is $6. Towels are provided. Warm up Shack: We have a small warm up shack located at the “All trails return here” location in the Bowl. This heated shack is stocked with wood and can be heated quickly with the wood supplied if it is not already heated. This makes for a nice quiet location for a lunch or snack. Ski Shop: We have a complete ski shop with the latest equipment and supplies.